www.searchingforreason.net : THE BERMUDA TRIANGLE. CASE #1. 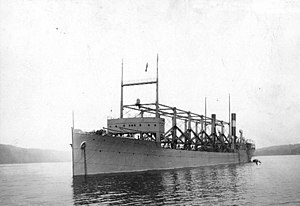 USS CYCLOPS. PT 5. THE BERMUDA TRIANGLE. CASE #1. USS CYCLOPS. PT 5. The Disappearance of the CYCLOPS, While Tragic, was never considered to be an Exceptional Event, Unparalleled in Maritime History. The Loss of a Ship, without a Definitive Cause, is not an Extreme Rarity. The Fate of Many Ships, Lost Through The Centuries, have never been Satisfactorily Explained. The CYCLOPS did indeed Disappear, but like so many other MISSING SHIPS, PLANES, PEOPLE ETC., THERE JUST ISN'T ENOUGH EVIDENCE TO CONCLUDE THAT IT WAS CAUSED IN A PARTICULAR MANNER. MOST LIKELY, IT WAS A SERIES OF INCIDENTS, COUPLED WITH CONDITIONS THAT DEVELOPED DURING THE VOYAGE, THAT LED TO THE DISASTER. SINCE THE EXACT CAUSE(S) IS UNKNOWN, WE CAN SPECULATE THAT MAYBE UFOS, CRYPTIDS, OTHER DIMENSIONS, THE LOST CITY OF ATLANTIS etc., are possible causes. EXACT CAUSES, DOESN'T MEAN THEY DON'T EXIST. WHY? SPECULATIONS WITH NO REASONABLE PLAUSIBILITY OF OCCURRENCE. of the CYCLOPS in the next Post.